As a new Kindle 2 owner, the first thing I did was research and pick out a case to protect it. About a week ago, I decided to try out the M-Edge Platform case and have used it since then. This case flips open from the top, and can be opened to serve as a platform to prop up your Kindle on a table for hands-free reading. I decided on it because (a) I wanted something that was rigid (as opposed to padded) to protect the screen, (b) I wanted something small and light, (c) I wanted enough room for a pen and small notepad, and (d) I like the hands-free reading idea. Oh, and I didn’t want to pay too much. I have to say the M-Edge Platform ($29.99) delivered what I was looking for. The case is essentially two rigid flaps hinged together at the top. When closed, a tab is slid into a hole to secure it. The tab takes a few seconds to insert or extract, but it closes the case securely and doesn’t seem like it would wear out like an elastic closure might. When you open the case, the top flap can be hinged backward and the tab can be inserted “in reverse” to create an A-shaped stand. This will hold your Kindle upright for hands-free reading (well, you still need to hit the next page button!). 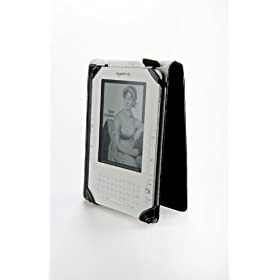 When opened and pressed flat, it doesn’t add too much thickness to the Kindle, so you can still hold it and read easily in the case, and you can reach the next page buttons on either side. I also appreciate that it doesn’t weigh too much, and I leave my Kindle in the case for reading. The Kindle attaches with two leather (I elected the cheaper imitation leather model, but I am pleased with the feel of it) corner attachments at the bottom corners and two elastic attachments at the top. From pictures, I feared it wouldn’t hold the K2 securely, but it does, I have no worry of it slipping out. I don’t know if the elastic enclosures become less secure over time, however. I also liked that there is a small pen loop at the top, and a business card pouch plus a thin pocket on the inside of the front cover. I like the idea of keeping a pen and small note pad to jot down writing ideas, but they add almost no bulk or thickness to the case. The inside covers are lined with a soft felt material. There is also room along the left side of the K2 (and a pouch to slide the base into) designed to hold an M-Edge reading light (which I do not have). Some may not like that this causes the Kindle to be off-centered in the case, and it may be difficult for people with smaller hands to reach the left-side buttons, although I had no problems with it. All in all, I have to say that the case exceeded my expectations, and I am actually a picky reviewer. The quality of the materials feels good (of course, it’s fake leather, but I’m fine with that… they do make a more expensive real leather version). It is about as thin and light as possible while still affording good protection, and it feels supple on the outside but there is a rigid core in the front and back covers that appears to protect the K2 well. The A-frame reading platform may come in handy, I’ve used it while eating lunch a couple of times, although I normally read with the case folded all the way back. Essentially, the case did everything I hoped for it to do. Those of you who like to carry more than a pen, business card, note pad, and light with your Kindle (like if you want to bring the USB cord/power adapter or keys) may not like this device. And it does not fully enclose the Kindle, so it would not protect as well from dust or spills as the zippered cases. But, if your needs are like mine, I can heartily recommend this case and give it an A.